The past few weeks at school have been very fun. Since I have adopted the mindset of "have no expectations so you cannot be disappointed," I was not surprised to see that school was put on hold for an entire week while children learned about camping and scouting. 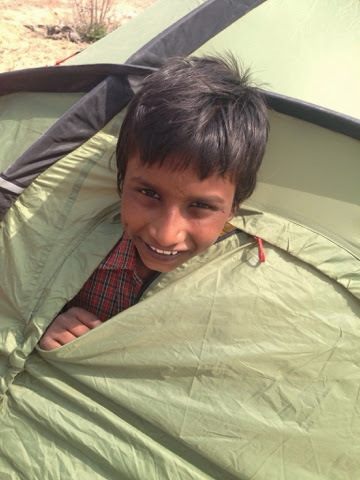 I showed up to school last Monday to see children attempting to pitch tents. They were learning about scouting, including cooking their own meals and learning camp songs. 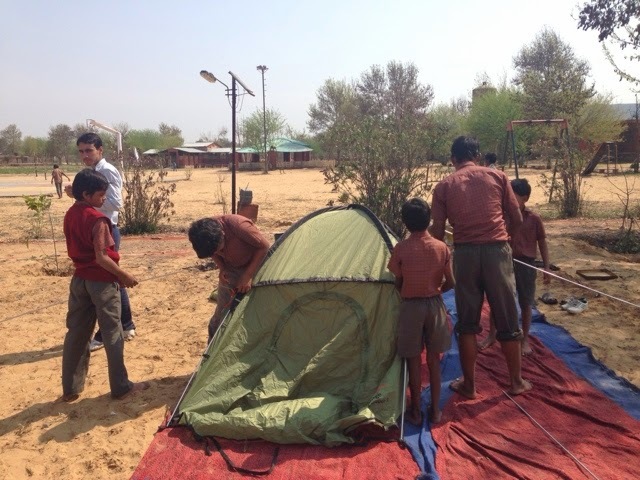 Most of the groups were able to quickly pitch their tents. I was of no help since I have never camped before. I prefer hotels. 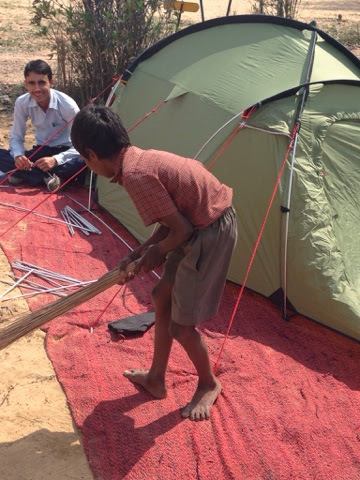 Despite being in a desert, Aakash still swept the sand away from his tent to keep it tidy. 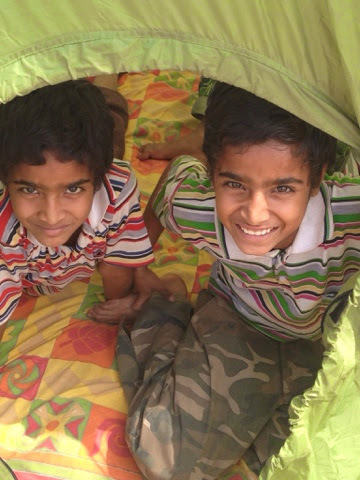 Everyone was proud of their tents and excited to set up their own space inside. With five people to a tent, it was pretty cozy. Here are the kids preparing lunch. I got stuck with cutting the potatoes. It's pretty hard work when you're using a dull "knife" and don't have a cutting board. It made me truly appreciate Deepak, who cooks three meals a day, usually without help, for so many people! I thought this was rough and there were many of us pitching in. 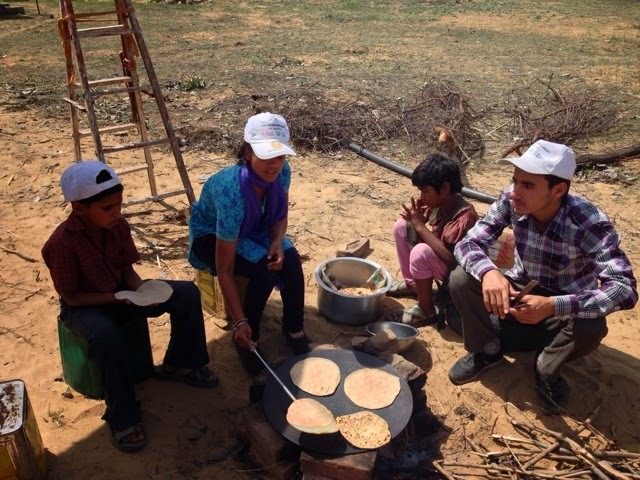 The above picture shows chapati which is like a flat bread. We get this with every meal and its pretty much unlimited - take as much as you want! There is an art form to making it, however; and a few of mine were rejected. The beginning stage of subjee. This is a blend of garlic, ginger, and many spices. Later we added potatoes, peas, and water. Cooking the chapati. After it is cooked on both sides, each one is put over an open flame to give it those yummy charred spots. Then some butter is brushed on. It took about 2 hours to get lunch finished, but it felt good to eat something everyone worked hard on. After lunch the kids rested and worked on homework outside. Some kids were also practicing their songs for a talent show that was happening around a campfire later that night. 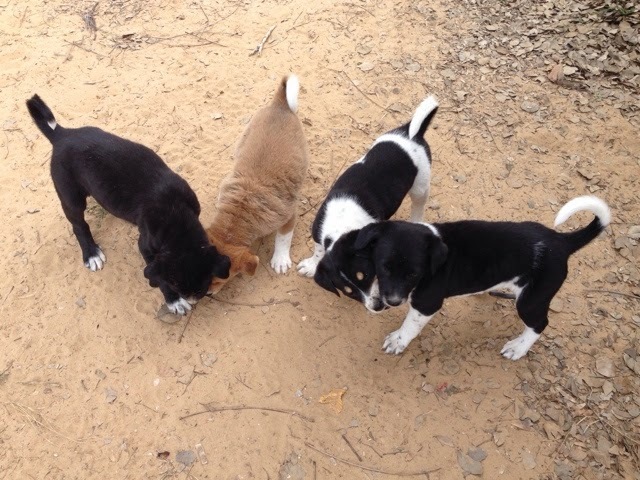 I discovered some stray puppies after lunch and they were so cute! 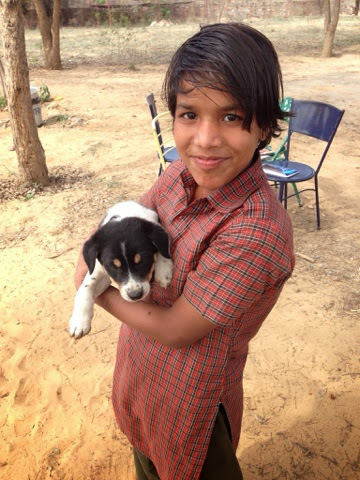 They come by school to eat scraps and are shooed away, but they always find their way back. At the end of camping week at school, the Kantrud's came to visit us. Matt's parents and sister arrived Friday afternoon and stayed for a week. 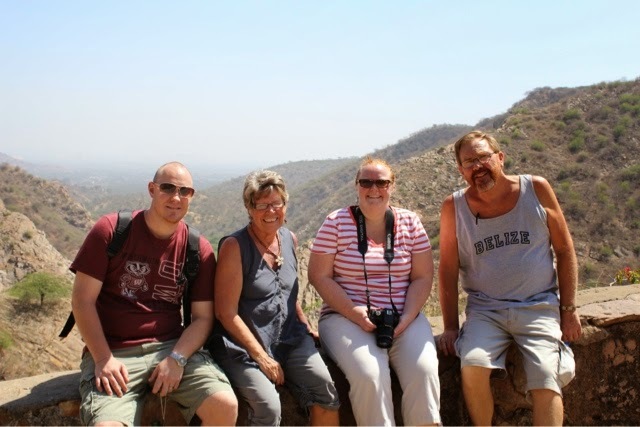 We did some sight seeing in Jaipur and they also went to a tiger sanctuary for two days. We were able to see them earlier in Delhi too where we saw some sights together. 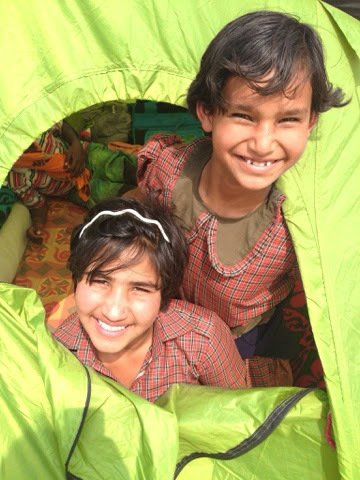 They are spending several weeks in India travelling to different places. Here we are at Humayun's Tomb in Delhi. 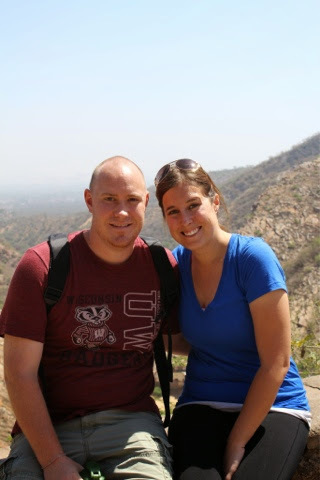 This was at a place called Chokhi Dani in Jaipur which Matt and I had been waiting to go to. It is a mock traditional Rajasthani village. We were served a traditional dinner while sitting on the floor. 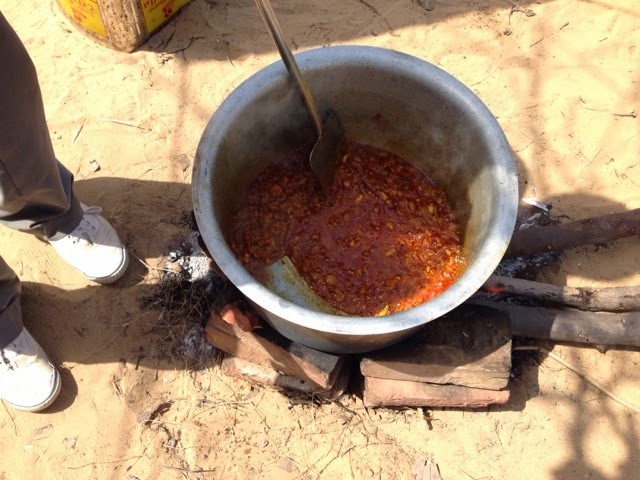 Some dishes were really spicy! 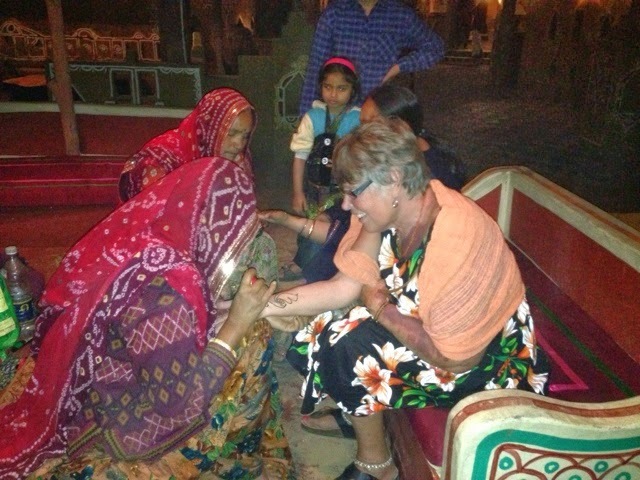 There was also elephant and camel rides, henna, a market, and dancing. It was really fun. Unfortunately Carrie wasn't feeling well so she couldn't make it. Jo and I both got henna. I of course smeared mine after 5 seconds. Here we are at Monkey Palace. Sadly we didn't see as many monkeys as the first time we went. Matt's dad, Steve, was nice enough to pose for a picture with these guys. 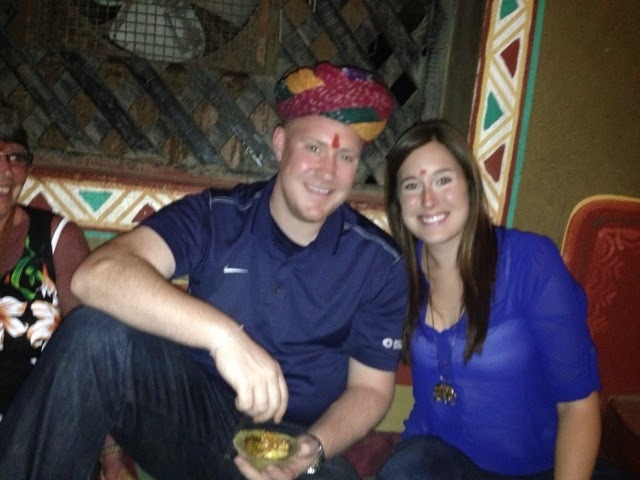 Indians often want their picture taken with a white person. It's like he's a celebrity! 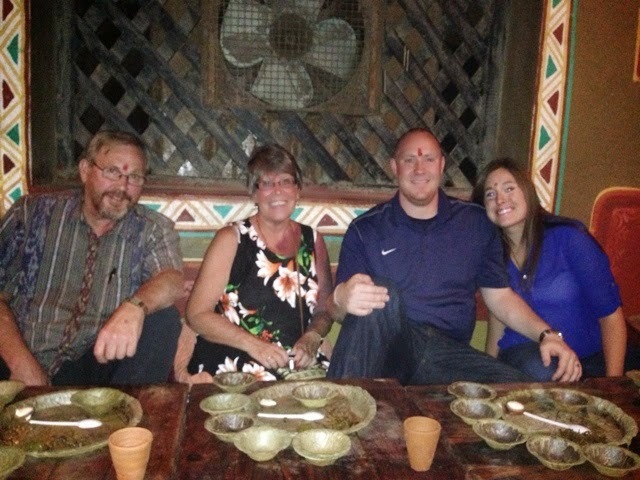 It was fun to have visitors in Jaipur, and I hope Matt's family enjoys the rest of their visit in India. They may need a vacation from their vacation! Surviving in India can be hard work. Laura! India is really an impressive country. You can see there unlimited places of your choice. Your blog is very attractive for me because I am also a tourist and I love to hear about others travel stories. The camping and the food everything is looking very amazing. 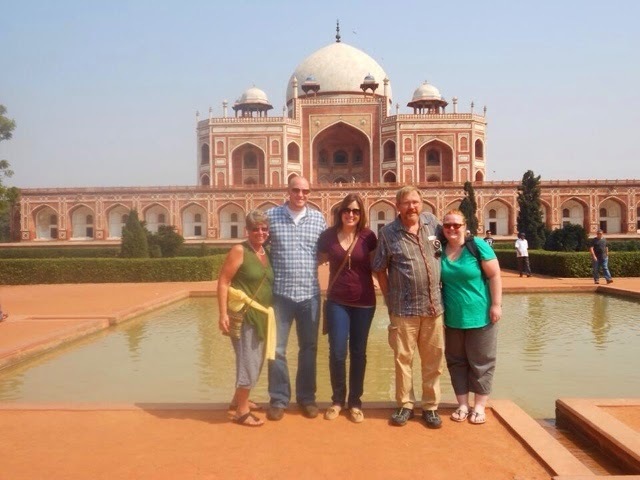 Last year I got a chance to visit the Humayun's Tomb before my boston bus tour. It is a very unique and fabulous historical place. Its construction was started in 1565 and completed in 1572. It is the perfect place for history lovers.